Having pretty cake toppers this time of year is down right necessary. I mean, on life’s list of things you need this week… a pretty way to top our cakes with butterfly cake toppers should be ranking up there. 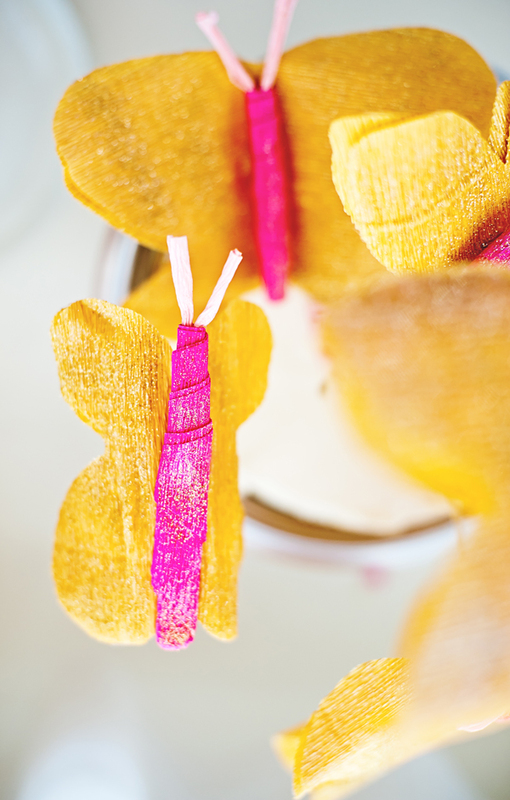 :) With Mother’s Day coming, bridal/baby shower season in full swing and birthday brunches filling my schedule, these bright glittered butterflies are an easy way to finish off all spring sweets in colorful style. Along with the brunches and festivities of spring, I also get a crazy desire to clean this time of year. Projects like glittering 25 crepe paper butterflies seem equally dreamy to display and dreadful to make as I consider the never-ending cleanup that comes with using gold glitter in my house. 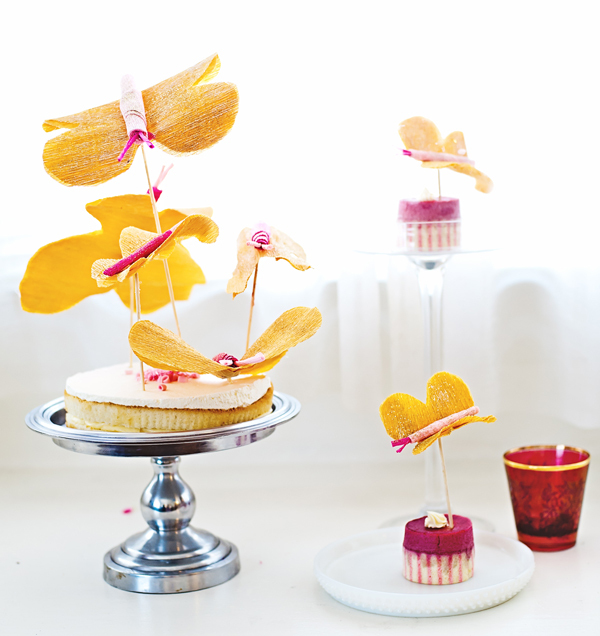 Although glitter or not these adorable butterfly cake toppers will take center stage this spring. You can even buy paper already glittered to create them right here. 1. Start by cutting out the butterfly wings. 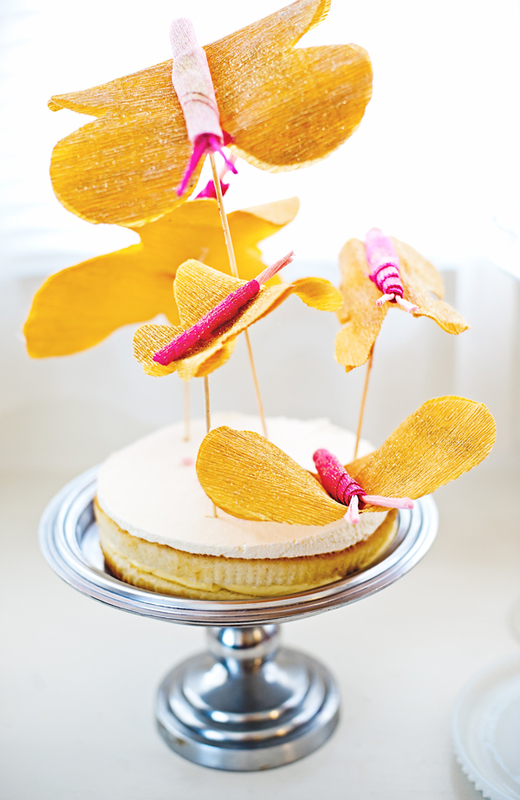 Having two layers will give the butterflies a gorgeous sense of fluttering as they top your cakes. 2. 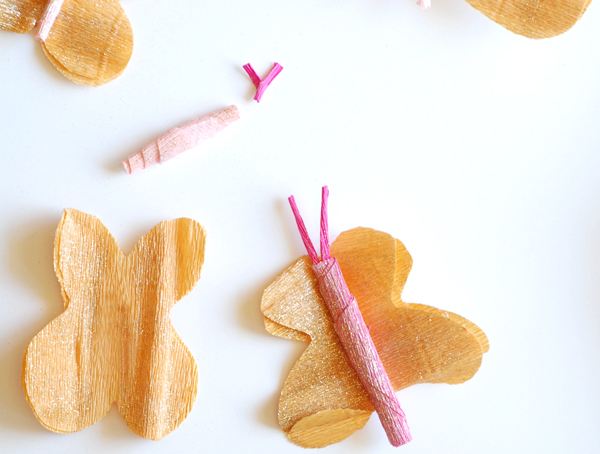 Cut a small piece of pink paper (about 5 inches long by 2 inches tall) and roll it to create the butterfly body. Roll a 1 inch piece and fold in half to make the antenna. 3. 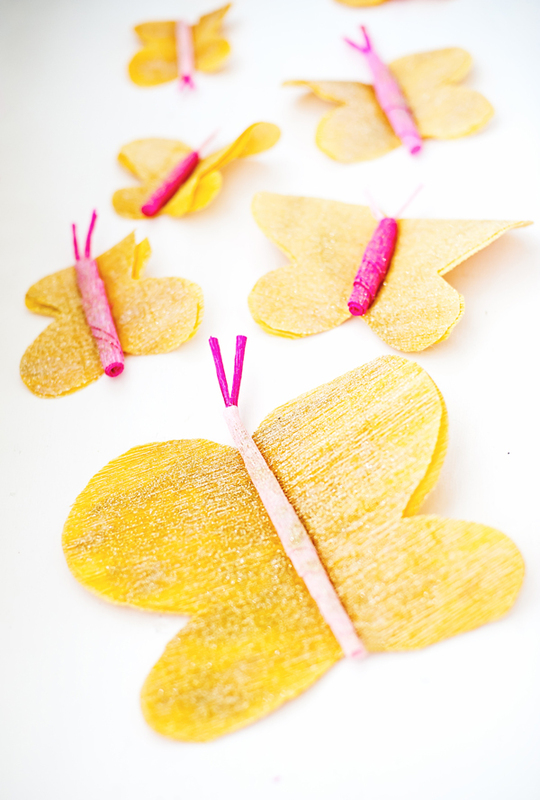 Following this basic template you can create butterflies in many different sizes. Once the pieces are cut and rolled, use hot glue to attach the antenna and the body parts together. 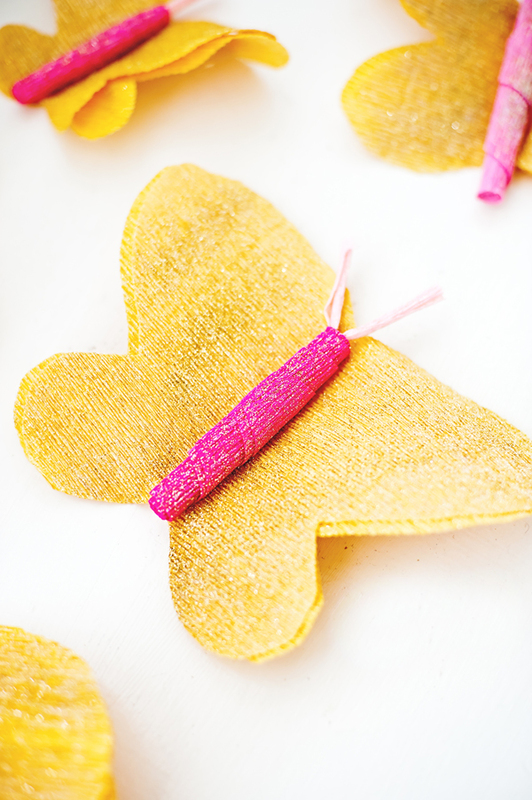 Lastly, spray the spray adhesive onto the butterfly wings and sprinkle golden glitter onto the top. This step is optional I suppose, but the glitter really makes these paper butterfly’s come to life. 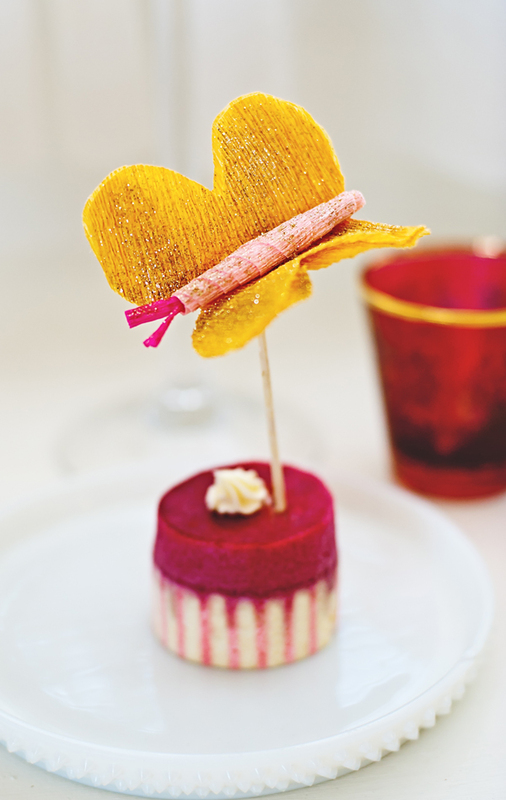 Once the butterflies are made, they can be added to cakes, cupcakes—really any type of food. Try them on a pineapple coconut cake! Rest the butterfly gently on top, or glue the bottom side to a bamboo kitchen skewer. Break off the ends for a shorter or longer stand. I love the effect a handful of the butterflies all at different heights gives to a cake, like they are flapping their golden wings around our sweets.